In Vietnam, children are often being taught from an early age that animal abuse is normal and right. Kids see the way their parents and peers treat animals and they mimic it. Unlike in the West, most children here experience animal slaughter close up in their villages. It’s uncommon to see pets on television shows or to see any advertising for pet products that may depict positive relationships with animals. This makes it very difficult to show an alternative to the current model of bad treatment. 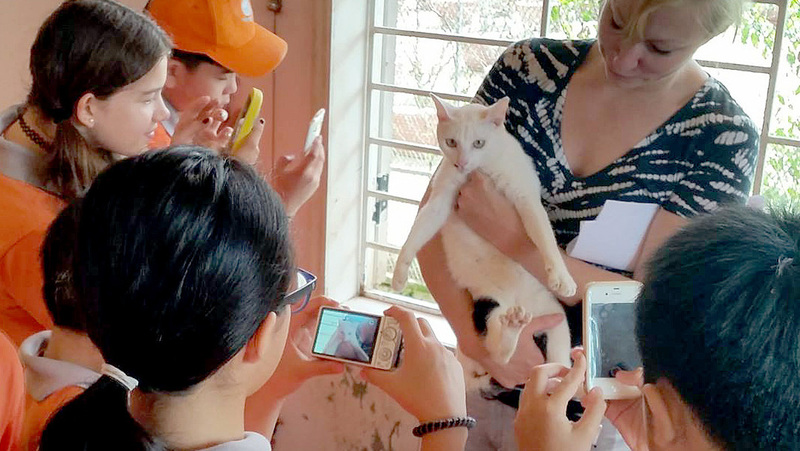 The best way to combat animal rights abuse is by bringing up a new generation of Vietnamese children that value animals’ lives, can care for them appropriately, and can be “junior rescuers” when they see abuse happening. Bringing positive imagery of human-animal relationships to children through popular media such as cartoons and games in addition to providing them hands on experience of their own with animals will give them a chance to change their thinking on how they can interact with animals. Our education program begins with an interactive discussion on the Five Freedoms of Animal Welfare as it relates to humans and then how it relates to animals of all different species. Children must be taught that a water buffalo, monkey, pig, squid, cat, or dog all have the same desires for living a life free from pain and suffering. If we focus education programs only on companion animals, the message gets confusing as kids are taught to love some animals and participate in the industrialized torture of others. If we accept all animals as being morally significant and we acknowledge that humans have no right to use them for our pleasure, amusement, or convenience, it is hard to justify this speciesist position and children need to know that from the beginning if we are ever going to make any headway in protecting animal rights in the future.